SINGAPORE -- The United States and South Korea are scrapping another major military exercise this year, a Pentagon official said Friday, citing a push for diplomatic progress with North Korea. It was the latest move aimed at trying to nudge North Korea, which despises such U.S.-South Korean exercises, into negotiating about giving up its nuclear weapons in a way that can be verified. "They pledged to maintain close co-ordination and evaluate future exercises," she said. She said Mattis consulted Japan's Minister of Defence Takeshi Iwaya on the matter and they "reaffirmed their commitment to regional security." Mattis was in Singapore for a meeting of Asian defence ministers. On Friday he met jointly with his South Korean and Japanese counterparts and then met separately with the Japanese minister. In June the Pentagon cancelled this year's Freedom Guardian exercise after President Donald Trump abruptly announced that he disapproved of what he called U.S. "war games" in South Korea. He called the manoeuvrs provocative and expensive. 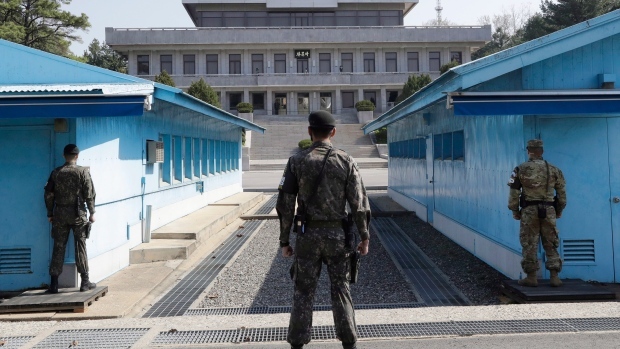 For decades, North Korea has strongly objected to large-scale U.S.-South Korean military exercises, calling them dress rehearsals for an invasion and part of an American strategy to stifle the North. The U.S. has insisted the manoeuvrs are strictly defensive and are necessary to ensure a strong defence against the North, which invaded the South in 1950, prompting the U.S. to end the conflict on the South's side. Last year's version of Vigilant Ace lasted about one week and involved more than 200 aircraft from the U.S. and South Korea flying from eight bases. The stated purpose, as with most such manoeuvrs between the U.S. and its allies, is to ensure that the two militaries can operate together effectively and safely in wartime and to deter an adversary like North Korea.